Get up, get on, and get ready for the ride of your life. 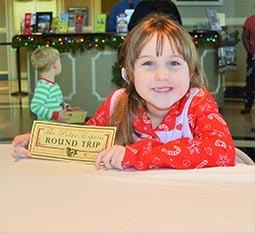 The story of the Polar Express will be performed to the delight of the young passengers. At the end: All will believe!! Two Performances per date: 1 p.m. & 3 p.m. on the passenger car in the Museum's Transportation exhibit area. 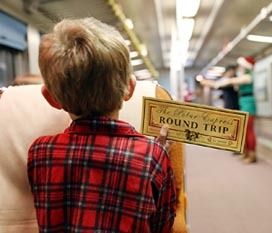 Children should be in their pajamas and must have their "Golden Ticket" to board the train. No adults will be allowed to board the train. Space is limited to 36 children per performance. After each performance, children and their parents will be treated with hot chocolate and cookies in the Museum's Rotunda courtesy of Tastefully Yours, LLC., with an appearance from a special Christmas guest!!! *All accompanying adults will be charged regular admission - if a member of the Museum, the adult will not be charged. Tickets are available online through Eventbrite!! Tickets can also be purchased at the Augusta Museum of History administrative offices via cash or check Monday through Friday 10:00 am - 5:00 pm. We apologize, but no tickets will be sold over the phone. To stay up to date with All Aboard! The Polar Express 2019, please like us on Facebook.